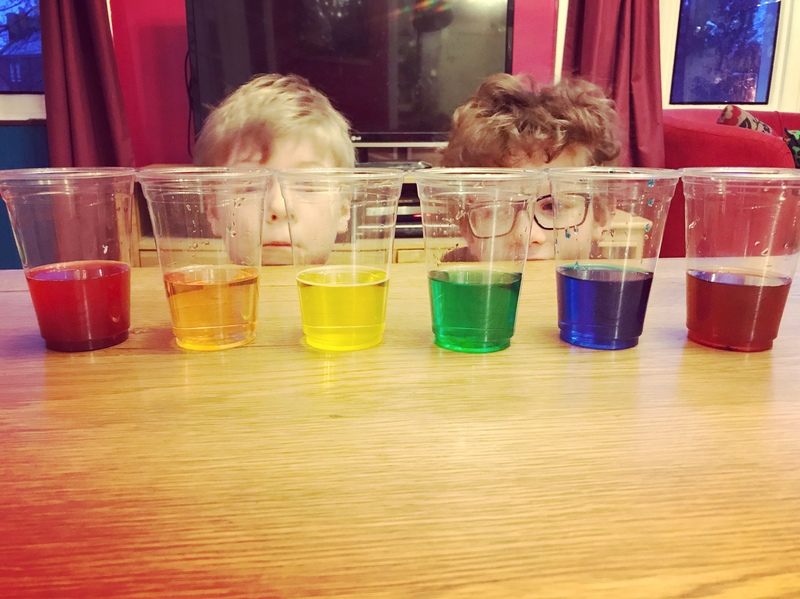 Living in a house full of boys and with Daddy being a scientist means we get to do some fun experiments and Daddy is always on hand to explain things I can’t, which is fab (GCSEs and google only gets me so far!). I saw the “Walking Water” experiment do the rounds on social media last week and couldn’t resist giving it a bash over the weekend. It takes about 2-3 hours but it’s great and quick to set up, check in on and discuss the why and how. The boys lined up 6 cups and filled 3 with water and placed them in 2 rows of 3. We added red food colouring to the first cup and yellow food colouring to the third cup (on the first row). Then we added blue food colouring to the second cup (on the second row). We then folded the paper towels up and added them so each end was in adjacent cups. The whole thing took about 10 minutes. We watched the water soak up the paper towels and meet in the middle. I asked the boys what they thought would happen and they clocked straight away that the colours would mix and speculated it would make a rainbow. We talked about colour mixing and went over primary and secondary colours. We did some painting and tried our hand at making our own colour wheels a few weeks ago. I’ll follow that up with another blog post – we need to finish them first! The art student in me loves a bit of painting and colour mixing is right up my street. With the 3 primary colours; red, blue and yellow you can literally make every colour of the rainbow. This experiment is a fantastic visual for showing how the secondary colours can be created. Daddy explained the science to them; a colourful demonstration of capillary action. For example this is how plants pull water from the soil. *Cue watering all the plants in the house to watch them pull the water through the soil! After 10 minutes the 3 empty cups all had water in them. The boys were amazed. All the paper towels were soaked with their respective colours. Before bedtime (a few hours later) we checked on them again and the boys were very excited to find a rainbow. All 6 cups had roughly equal levels of water in too, which Oren found particularly fascinating. The water had literally walked out of the cup and into an adjacent empty one! We had successfully made the secondary colours; green, orange and purple. We took the paper towels away and inspected our creation after Loki had gone to bed. The boys then had lots of fun mixing and pouring the coloured water trying to make more colours as we touched on tertiary colours ahead of completing our colour wheel painting activity. The boys are now looking forward to finishing up the colour wheels and are planning some sensory water themed play later this week! We tried a few different versions of this experiment and this was the best!